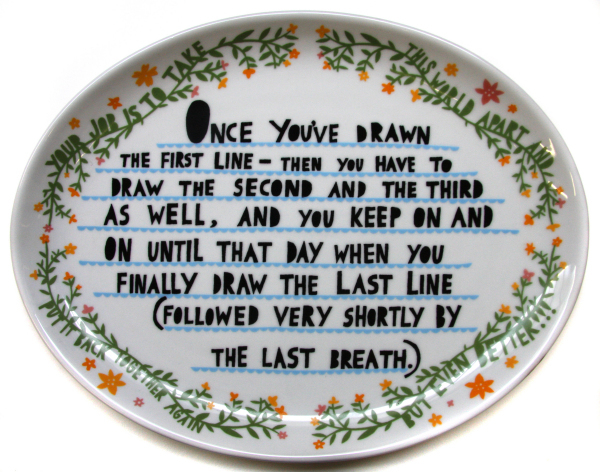 On Friday, I was thrilled to board a fast train at Euston with Rob Ryan, the papercut supremo, racing North through the dusk to Stafford for the opening of his latest exhibition. “Your job is to take this world apart and put it back together… but even better,” at the Shire Hall Gallery in the Market Square in Stafford, follows just two weeks after the breathtaking sellout success of Rob’s show at the Air Gallery in Dover St, entitled “The stars shine all day too.” He certainly has a way with titles. 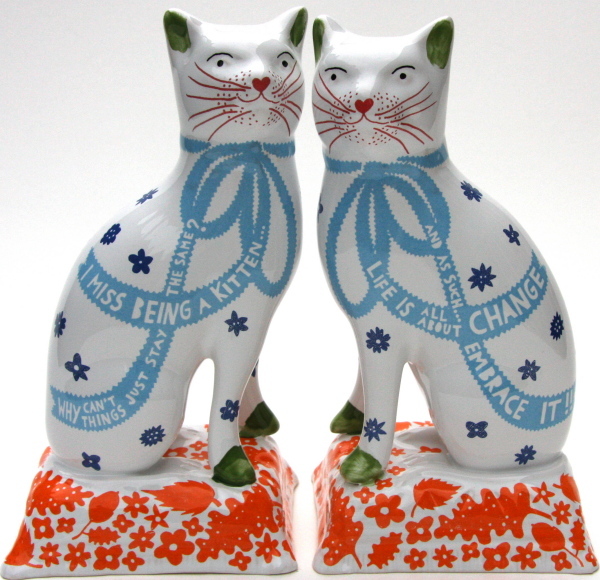 While the London exhibition comprised monochrome papercuts and prints – some of truly astounding size and ambition – this show in Stafford features the papercuts he made as illustrations to complement the text by Carol Ann Duffy for “The Gift,” as well as some remarkable ceramics that signal a new departure for him. The gallery in Stafford sourced nineteenth century moulds for Staffordshire figures and they have cast new ones for Rob to decorate. 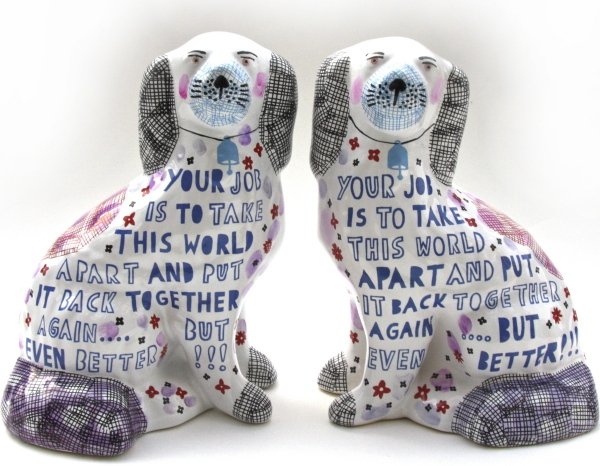 When I visited Rob at his show at Somerset House in the Summer, there was a Staffordshire china dog that he had already decorated sitting upon his desk. By adding a pair of glasses, Rob had drawn attention to the unlikely resemblance between himself with his luxuriant locks and the spaniel with its curly ears. We used to have a pair upon the sill at the top of the staircase when I was child, so I was fascinated by Rob’s hilariously extrovert reworking of these inscrutable figures. And for months now I have been looking forward to seeing these new works, at their first public showing here in Stafford. 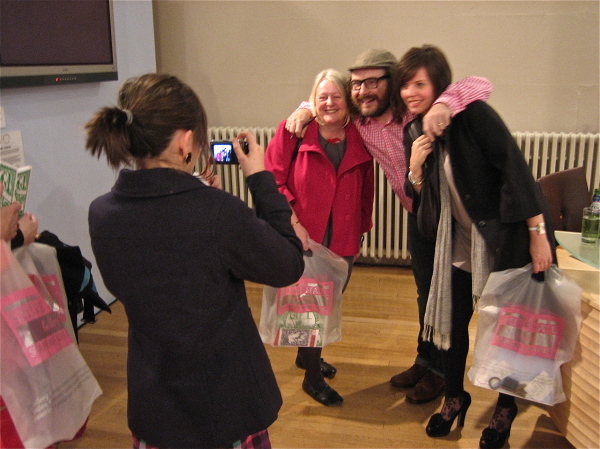 After dozing on the train up, we walked through the dark and frosty Friday-night streets of Stafford, and into the tall bright spaces of the Shire Hall where the rich colours of Rob’s papercuts and prints glowed with exuberant life. I went straight to the cabinet of shelves filled by pairs of china dogs and cats, all staring back at me through the glass. There was an exciting tension between the poise of their nineteenth century form and the lively decorative sensibility of Rob’s designs, animating the figures with idiosyncratic personality. 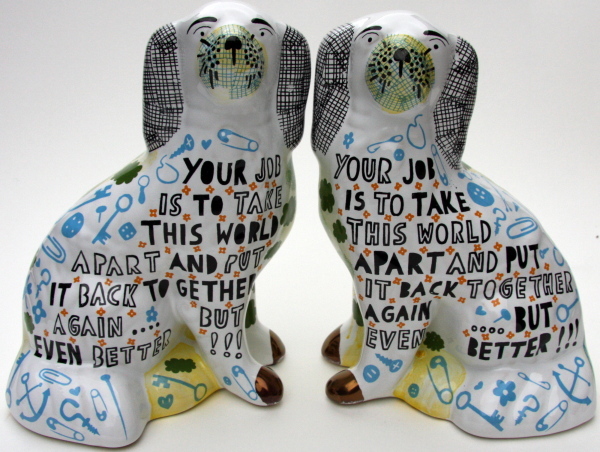 It was the perfect marriage of two disparate threads of folk art, the Staffordshire figure and the papercut, both reinvented by Rob Ryan in an entirely contemporary way. 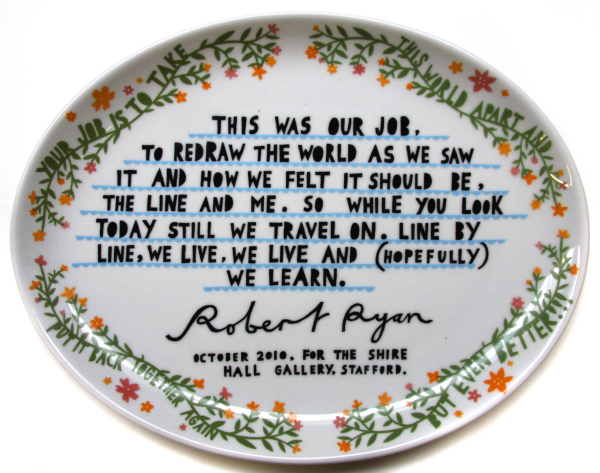 The words which Rob applied exemplify the thoughts I always imagined the dogs on my parents’ staircase harboured. 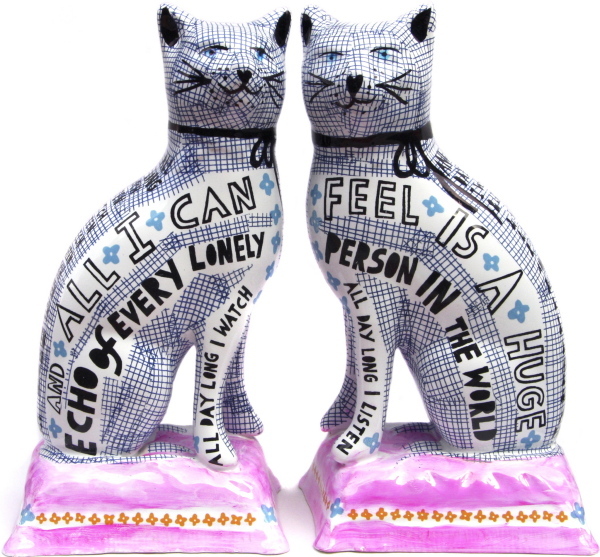 Naturally meditative and sometimes contradictory, reflecting the fact that these creatures are mirror images of each other, the texts are secret insights into the collective psyche of china dogs and cats. Now we know what they were thinking all along. I was interrupted from my reverie by a local councillor giving a speech. He appeared to have stepped from a novel by Arnold Bennett, quick to declare his lack of specialist knowledge, yet eager to give his modest opinions at length about contemporary art, before swelling with pleasure to introduce the poet laureate Carol Ann Duffy, whom he chose to regard as a local lass – the pride of Stafford – in spite of her origins in Glasgow. By now the gallery was full with an enthusiastic crowd and once Carol Ann declared the show open, Rob found himself inundated with a long line of fans eager to make his acquaintance. And as my pictures testify, dressed for the occasion in a bright pink gingham shirt, and with a playful nature and a mantle of unkempt curls comparable to the lion in the Wizard of Oz, he is the consummate showman. Meanwhile, the rest of the citizens of Stafford spread out to scrutinise the immense detail of the works on display and I slipped among them, taking a closer look for myself. The bright energy of these intricate pieces draws your attention and then the subtle melancholy touches your heart. 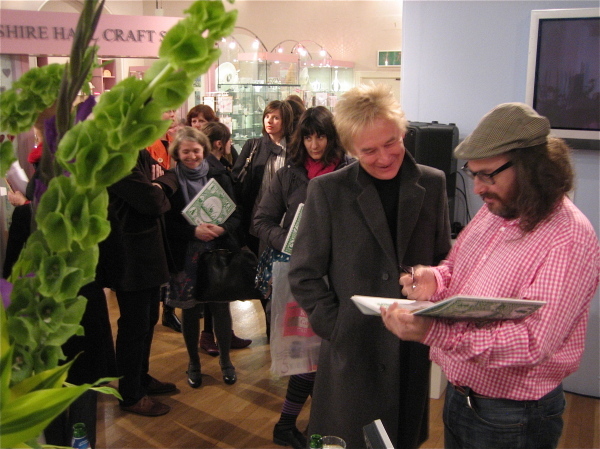 As I noted all the delighted faces, I realised it was an immense body of achievement and a phenomenal finale to a year of hard graft by Rob Ryan. Then suddenly it was time to hurry back through the maze of streets to the railway station, riffle the vending machine for snacks and hop onto the last train back to London. Rob brought out his game of Boggle and the happy atmosphere in the darkened carriage rattling through the night was more like that of the returning leg of a school trip than you might expect after a major exhibition by a rising star – yet it was the ideal way to wrap up our adventure on the papercut express. 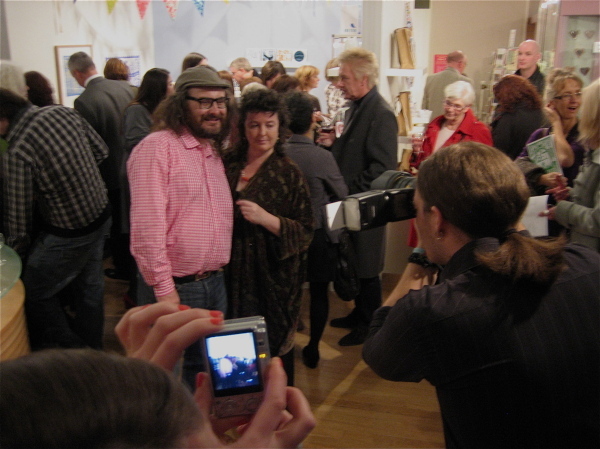 The paparazzi move in on Rob Ryan and Carol Ann Duffy, the poet laureate. 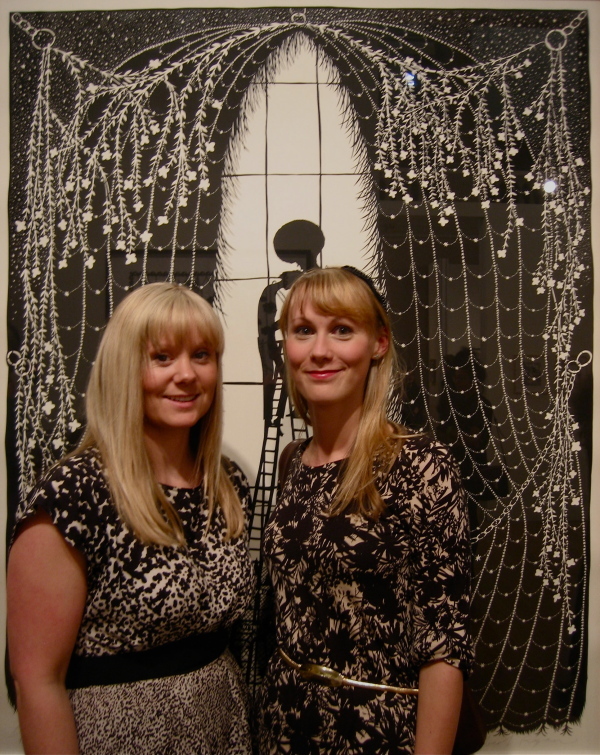 These two ladies wore dresses to camouflage themselves amongst Rob’s papercuts. Rob enjoys a game of Boggle on the night train home from Stafford to Euston. Your job is to take this world apart and put it back together again … but even better runs at the Shire Hall Gallery, Market Square, Stafford until Sunday January 9th and The stars shine all day too runs at the Air Gallery, Dover St, London until Saturday November 20th. Highly reccommend Uno on the train too! Am delivering heavy hints to my family that Rob’s embroidery kit ‘Give Me Work’ would be perfect for my Christmas present. The house that Sir Frederick Gibberd lived in in Harlow has the most fantastic collection of Staffordshire china dogs. Well worth a visit.